In a world with so many information to read and process, it’s hard to find the time/energy to analyze all the tweets or blog/linkedin posts, there are so many nice notes that I would really like to check all of them, but they make me feel overwhelmed and wondering how younger people stay in and enjoy it. Are you thinking to develop your own big data analytics personal widget? … Well, I am! I have to admit, if your target is staying updated, you need to keep a recurrent contact with all this continuous outburst of data, and find some way to domesticate it. 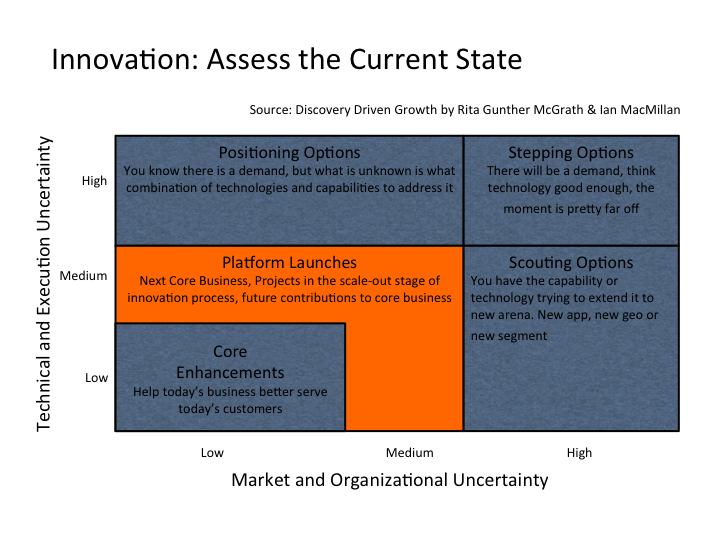 Now it’s down on me: What would your next step be on developing new products or services? Which path do I need to follow? I don’t have an unlimited budget. Then, stop a minute overhearing in the network and assess your current status of innovation. Now the next question: How? Well, my case, I like the way that Rita Gunther McGrath and Ian MacMillan have exposed how to do it in their book “Discovery Driven Growth“, and I will bring my humble personal synthesis about it through the next lines (more information in the picture at the end of this note or buy the book, don’t be tight!). First Step – Core services: You need to first understand what your company core services and the related technologies are. After that, see what improvements could be addressed in regards to customer unsatisfied or additional needs in such services (be closed to your sales teams to get direct feedback), what do your competitors have than you don’t?, or what is new on the market for the technologies used behind and if it makes sense as an competitive advantage or to save costs. KIO’s core datacenter services are offering Colocation, Hosting and Managed Services to Mission-Critical Applications. In this case, the improvement could be related to lower costs for cooling, implementing a new communication core architecture (I invite you to see my note about how SDN change Datacenter Core Switching Architecture) and increasing rack power density, etc. Third Step – New Options: You can take your core services to different geo or segment although there is uncertainty about the impact, or you can start a new service base on a unsatisfied demand, but look out, there is uncertainty about the chosen technologies could fit correctly. Also, base on market trends, you can prepare your company to face a future possible customer demand, but the technology is not mature yet. As you can see, there are three options, to name them in order: Scouting, Positioning and Stepping Options. I would dare to say, when KIO took what we do best to Central America two years ago (I mean core datacenter services), it’s a case of a scouting option, because we didn’t know with high certainty how this product could have impacted on this local market at this time. Previous Previous post: Original ideas are no longer exist?